Herculaneum was an italic city founded around the IVth century B.C. Towards the end of the first century B.C. the town become a resort center for the Roman aristocracy. Herculaneum seems to be more elegant and refined than Pompeii thank to its original architecture and ornaments, as well as to its natural position overlookig the bay of Naples. 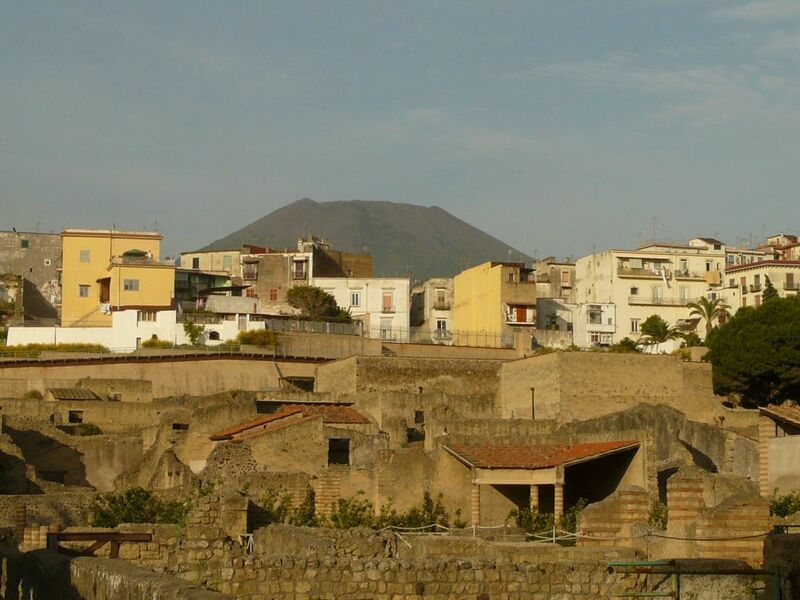 During the eruption of mount Vesuvius in 79 A.D. Herculaneum was not buried by ashes and lapilli, but by a torrent of mud flooding down from the slopes of the volcano. It solidified and became tufalike, so that it was for centuries the best possible defence against the atmospheric agents. Excavations began in 1709, while from 1738 to 1765 systematic explorations were financed by Charles III of Bourbons. In 1927 the excavations of the whole area were begun by Amedeo Maiuri. The MAV (Virtual Archaeological Museum) of Herculaneum is the only museum of our territory where you can discover how Pompeii and Herculaneum looked like before the eruption of Mount Vesuvius in 79 A.D. The museum uses an interactive technology able to let us running through the history and the daily life of some inhabitants of Herculaneum, described by their own voice. In the first rooms there are panels you can interact with to remove the virtual ash covering beautiful frescoes, in some more rooms you’ll even have the inpression to walk into the rain water onto some splendid mosaics wich used to decorate the rich roman houses. Before passing through the virtual hot cloud which buried Herculaneum in 79 A.D. we can enjoy the Papyri Villa; it was brought to light in the 18th century through some Bourbon tunnels whose reconstruction is part of the museum as well. By walking through the rooms we’ll stop at the one housing an interactive table you just need to touch to learn everything about the Roman custom. The visit continues by moving into the last room which reproduces the Forum of Pompeii and its big activity as political, trade and religious centre of the town itself. This will be much more than a tour..we are going to take a leap into the past!